With the Wireless PC card, you can connect with any 802.11b compatible wireless network. 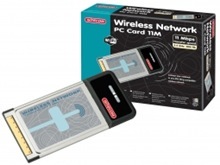 The Wireless PC card can work directly with another wireless card in an ad-hoc network or it can be connected to a wireless network equipped with an access point. If a wireless network has several access points, this Wireless PC card automatically searches for the strongest signal (roaming). Sitecom WL-011 has two hardware version, version: V1 001 & V2 001.